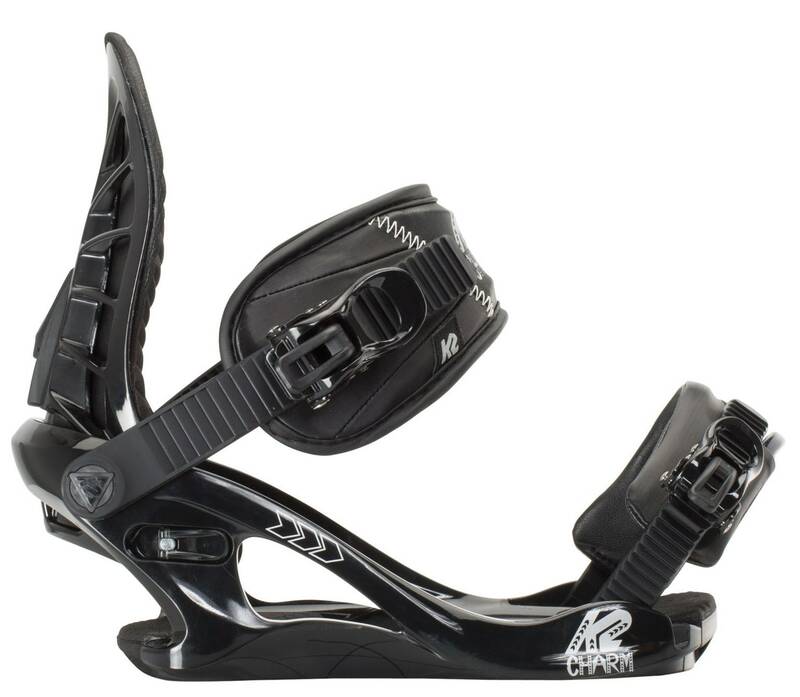 Charm the slopes in the K2 Charm women's snowboard bindings. 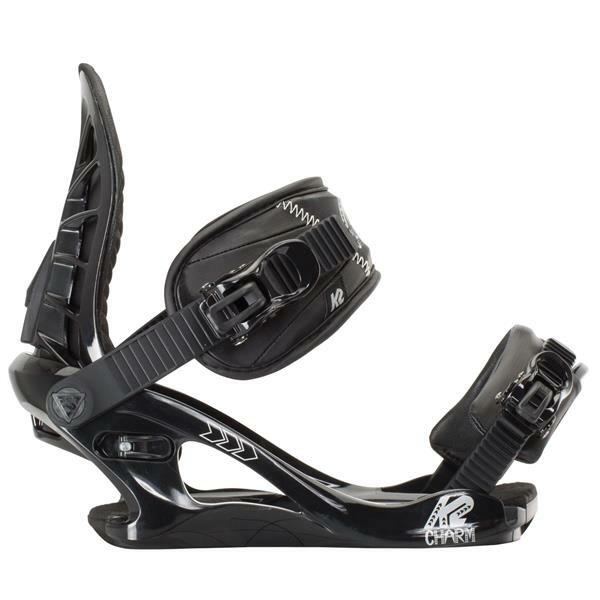 Featuring K2's Hella RADchet making strapping in and removing your foot easier than most other bindings. 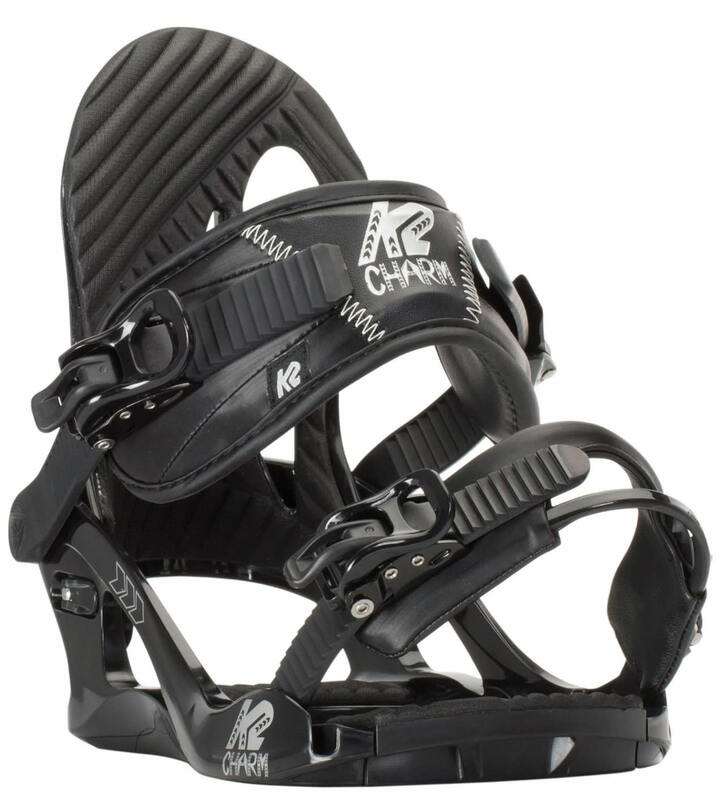 A tool-less adjustment system also creates ease in wearing the K2 Charm women's snowboard binding. Airlace highbacks allow for overall support and the 3D profile The Charm is designed to be easy to wear and good looking. The baseplates in the K2 Charm are intended to be high performing and lightweight so you can perform at your top level. 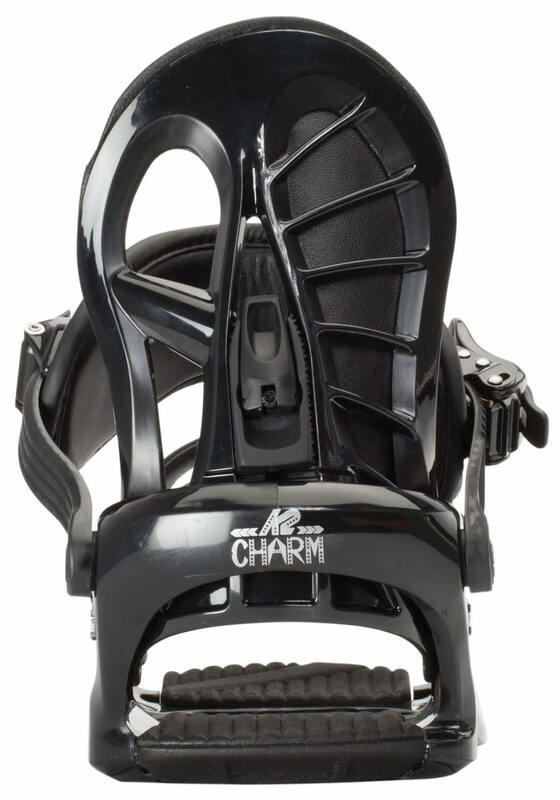 With discs in the baseplates being compatible with many boards the K2 Charm women's snowboard bindings will look great on all types of snowboards. A sleek look available in black will look fly with any board and every outfit you put on. This winter, step onto the formed EVA shock pads on the base of the Charm and feel the comfort all season long. I bought these for my girlfriend, who was just beginning. I bought her a K2 board, and found these K2 bindings for a good price. I wasn't buying her the most expensive ones, because I didn't know how interested she was going to be in snowboarding. My daughter said this was the one she needed for her particular snow board. will these fit in a burton channel style mountain system? BEST ANSWER: Hi Thomas.... no. Are you sre they will not work with Burton Channel? These description and filter says they do. I already ordered them based on the description but just noticed this note. Please clarify. Would this fit a kids board like the rome mini agent rocker which is 134cm? As long as the youth board uses the 4-hole mounting style... this binding could fit. You always want to be wary, however, of mounting adult bindings to a youth snowboard. I would not try anything above an 'S' size. My recommendation is to chat with our sales peeps at: 1 (800) 409-7669 they could make sure you get the right kit! If I'm a size 6 in boots should I get a 3-6 size or a 6-9 size in bindings? BEST ANSWER: The bindings are very versatile I would say you could get either or..but I would buy the 6-9 because the bindings are made to be customized to fit as snug as you want. 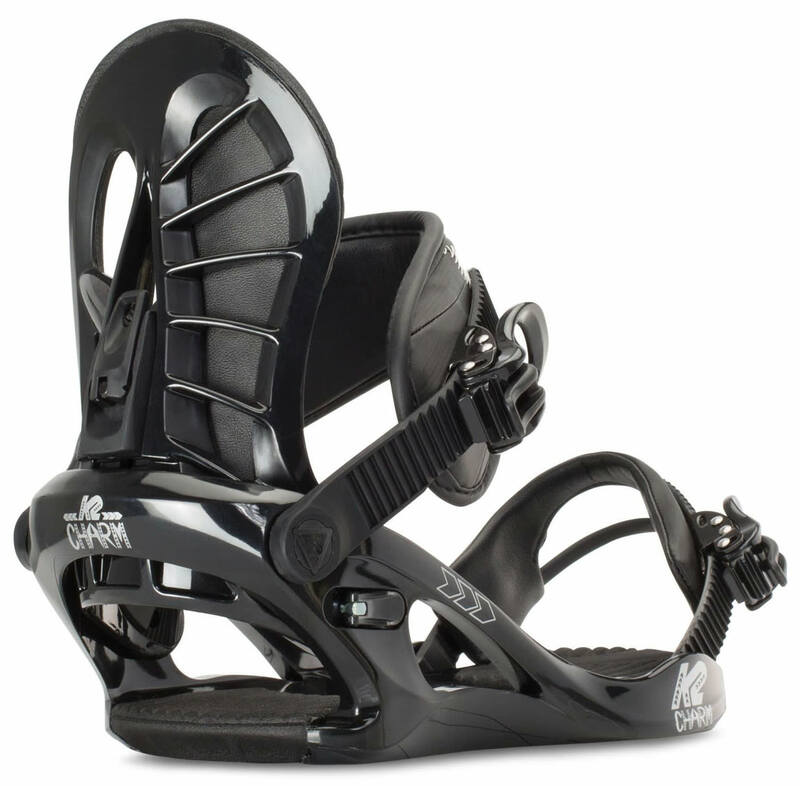 Will these bindings go well with the Rome heist blem snowboard? BEST ANSWER: Yes! It'd be a great combination! Good picks! Yep.. they will be compatible to the 4-hole mounting pattern used by the Gypsy. I have a burton with a 3d hole pattern. Do the bindings come with a compatible disk? or do you sell a 3d hole pattern disk I can buy? Will the K2 charm LARGE bindings work okay with a Morrow Women's Sky snowboard and 6.5 size Burton boots? They will all be compatible to each other, however I would not think that a 'Large' binding would be a good fit for a 6.5 boot. Thank you for the reply, i meant to say Medium size bindings. I ordered small bindings previously, which are being shipped, and now i'm unsure if maybe i should have ordered Medium size instead? Looking at the K2 Charm Snowboard Bindings with the K2 Brightlite, will the two fit fine with a size m binding, and is payment in US or AUD? They will work on a Rossignol board but the only issue is that since nine is the last size in that range, its going to be really hard to ratchet them down, just because your boot will be so big. If you are set on those bindings you could try pulling out the base plate, to extend them a bit. Will these bindings fit on any k2 snowboard? Yes... These Charm bindings will work on any K2 snowboard...... aside from Splitboards.